"That's One Small Indefinite Article for a Man..."
I am old enough to (vaguely) remember the Apollo 11 moon landing. 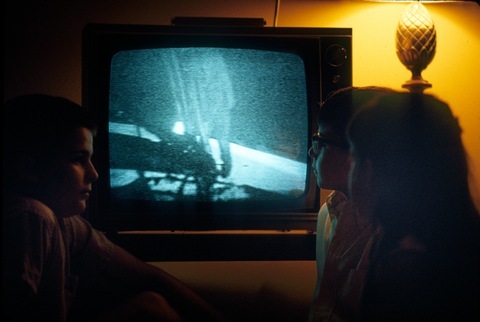 Watching as a spaceman-pajama-clad boy in our Mad-Men-era living room I saw the grainy black and white images on TV. (My parsimonious father wouldn't invest in a color set, or cable, until well into the 70s, so everything on TV was grainy black and white for me). I went over to a window and looked up at the moon, straining to see the flag the conquering space heroes had planted there. I was sure I spotted it. Here's what else I remember about Neil Armstrong: He never exercised. He believed that every person is issued a finite number of heartbeats at birth and he was damned if he was going to waste any on jumping jacks. Seeing as he lived 82 years before dying from complications when doctors started poking around his ticker...maybe he was onto something. The Vancouver Sun has commemorated Armstrong's passing with a story recounting his 1977 visit to Vancouver to open the restaurant atop the Harbour Centre tower. His infamous words: “That’s one small step for (a) man, one giant leap for mankind” will no doubt endure through the ages. You'll notice the a in parentheses. That's because the quotation is usually (and accurately) rendered without it. It always bothered me, growing up, that this, one of the most famous of utterances, didn't really make sense. "Man" and "mankind," in this context, mean the same thing. It wasn't until fairly recently that I learned about the dropped a--which was either the result of a gap in the transmission, or a slip of the tongue owing perhaps to Armstrong's giddiness on planting his boots on the fricking moon. When I discovered the way the line was supposed to be heard, it suddenly made perfect, elegant sense. No. He may or may not have dropped an a on the moon, but Armstrong's words were, and remain, famous.